Registered Nurses, Licensed Practical Nurses, trained medication aides, and certified nursing assistants provide service to the residents 24 hours a day, seven days a week. 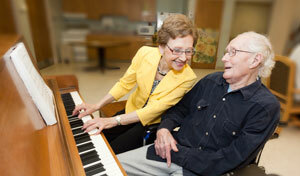 Pine Haven Care Center proudly serves the Pine Island and the surrounding communities. Our 70 bed facility provides both short-term rehabilitation and long term care for individuals requiring skilled nursing care. Pine Haven Care Center began its service to the elderly in 1964. We are a nonprofit limited liability company that was organized in 1962 for the purpose of providing health services for elderly and disabled individuals. Are you or a family member interested in moving to Pine Haven Care Center? Please contact Katie Eklund at 507-356-8304 ext. 129 for more information. Pine Haven Inc. does not discriminate in admission, access to, treatment or employment in programs or activities on the basis of a handicap in violation of section 504 of the Rehabilitation Act. Pine Haven Inc. is an equal opportunity provider and employer.